Musa (left) shaking hands with Jeffrey as other opposition leaders look at the State Assembly sitting yesterday. 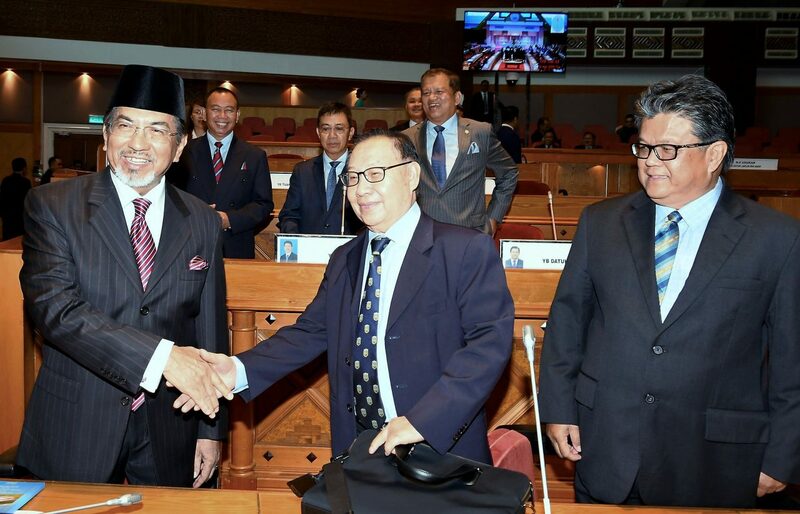 KOTA KINABALU: Former chief minister Tan Sri Musa Aman yesterday attended the Sabah Legislative Assembly sitting for the first time after having missed all the previous meetings held after the 14th general election. He arrived at the assembly building at about 9.50am, a few minutes after Chief Minister Datuk Seri Mohd Shafie Apdal arrived. The Sungai Sibuga assemblyman was welcomed by Datuk Jeffrey Kitingan (Star-Tambunan) and several opposition leaders from PBS and PBRS when he entered the building with a walking stick. During his surprise hour-long appearance, Musa asked a few questions. During Jeffrey’s first question, Musa asked Shafie a supplementary question on whether the current government has continued regular exercise of rounding up illegals and deporting them back home. Every month before we would ensure they were deported back to their home country. This was when the Tambunan assemblyman was chairing the relevant committee. Musa, who is the sole Umno representative in the State Assembly after all the other Umno assemblymen defected to Parti Pribumi Bersatu Malaysia (Bersatu), later stood up again to ask Infrastructure Development Minister Datuk Peter Anthony whether the proposed 175km railway line linking Kota Kinabalu and Kudat was mere empty talk in view of its high costs. The cost of such a project is too high that it seems to be just fantasy and not possible, Musa said, using the word Malay word angan-angan. However, Deputy Speaker Datuk Ahmad Abdul Rahman at this point chastised Musa for the use of language and said that Musa, as a former CM, should be careful in his choice of words. He asked Musa to sit down, stating that the latter should know the decorum in the sitting and use phrases like Di dewan yang mulia ini. Musa complied and rephrased his question. Both Shafie and Peter replied to his questions. Musa has been maintaining a low public profile soon after the GE14. Citing poor health, he skipped two State Assemby meetings last year as well as the official opening of the first meeting of the second session of th State Assembly last Thursday and also its first sitting on Monday. If he had failed to appear in the house during the current session, he would have risked losing his Sungai Sibuga seat. Sabah Speaker Datuk Syed Abas Syed Ali had said that it was necessary for an assemblyman to attend at least one sitting in a year to retain his or her seat. Musa, who is the sole Umno assemblyman in Sabah, is now facing 16 money laundering charges involving USD37.8 million and SGD2.5million. The Sessions Court in Kuala Lumpur has set May 6 for the hearing of the application on legal issues by Musas defence and mention of his corruption case. Musa finally showed up, asked some questions and left Borneo Post Online.